Today’s post is from good friend and ministry partner, Andrea Young – BabeOfMyHeart.com. It’s time to get your cupcake on!!! 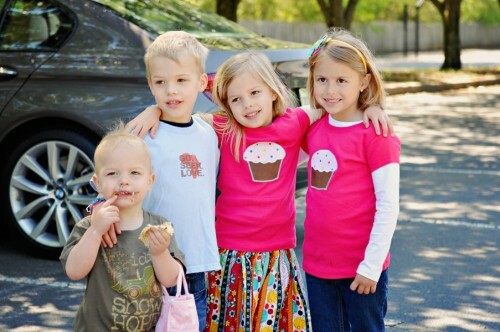 And this year the Young crew will be tag teaming AGAIN with the Carley and Coury Crew–friends of our family who have little ones with hearts to serve…and hearts for cupcakes:)!!! Last year, we baked away as our kids joined other Cupcake Kids around the nation to make a difference for the orphans of Uganda through SixtyFeet Ministry. How wonderful it is to involve our little ones and watch THEM make a difference for kids across the world! Our little team raised just over $500 in cupcakes…NOT BAD when you think how inexpensive boxes of cake mix are. This is a GREAT excuse to spend a Saturday with good friends while making a difference as a family with your littles! 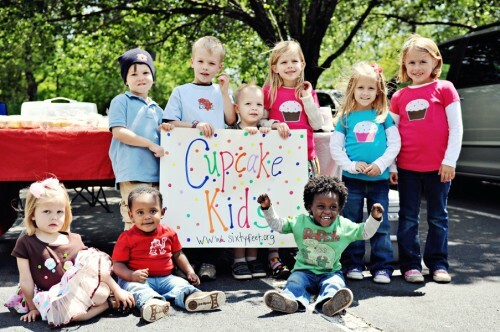 Here are our 2011 Cupcake Kids…(can you tell who was too busy eating cupcakes instead of selling them in these pictures?!) Isaac baby, our littles guy, wasn’t so sure and wanted me to hold him most of the morning—but I have a feeling our 2012 Cupcake sale will be a little bit different because this year he is running and all over the place! It was so amazing to explain to people who were just passing by the PURPOSE in our cupcake sale–and what the money would be used for. Perfect strangers would buy a cupcake for $20–and it was hard to tell them thank you because of the lump in my throat! Not only did it bring our kids together–but it was amazing to see our community around us WANT to join us too! Here’s our FULL cupcake crew last year—obviously you don’t need much at all to whip one of these up! A table, a poster, a few kids…and a lot of cupcakes! (Having Silas Carley on your cupcake team is obviously a plus too;). What I love MOST about opportunities with the kids like these–are the conversations we have afterwards. The kids were asking about serving others and kids in need. We had a lot of cupcakes left over–and we decided to take them to the kiddos at Convoy of Hope in Roswell to bless little folks in our area who came out today for groceries and jumpies and free medical care. WHO KNEW that the day Sixty Feet challenged us to sell cupcakes would be the SAME day that our city was serving the poor in our own community too! Before dinner that night, Laney came out of her room carrying several things she wanted to pass on to other children! To see your kids hearts shaped through service makes those late night bake-a-thons worth it!!! THANK YOU SixtyFeet for challenging our family to serve with something as simple as cupcakes! What IF we spent more time brainstorming with our children how we could serve our world–rather than be served…asking what could WE do for OTHERS rather than what do YOU WANT to do? It will not come naturally at first to us OR to them…but what a sweet habit to form–and to watch a heart of love, gratitude, service and mercy form in our sweet ones hearts as we invite them to come with us and even follow them in some of their own ideas to serve! 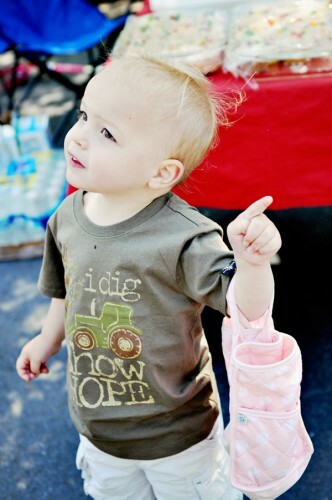 And SixtyFeet’s Cupcake Sale is ONE way to step out with your kids and begin!!! We can’t WAIT to get our cupcake sale on this year too! We’ll even be adding some gluten free and dairy free assortments to our mix this year! If you are going to be in the Roswell, Georgia area–COME join us and buy some cupcakes to support SixtyFeet!